Japanese trading firm’s dedicated server now powers its business across eight countries in the Asia-Pacific region. A MALWARE attack in 2014 had wiped out a day’s worth of data belonging to Emori Holdings, a Japanese trading firm. The data, which included critical customer and inventory records, was held in a Microsoft Dynamics NAV enterprise resource planning (ERP) system hosted by Emori’s hosting service provider at that time. “The hosting service provider couldn’t recover our data,” an Emori spokesperson says. “They did not offer a solution or compensate us for the losses”. Worse still, there was nothing Emori could do, as the trading firm did not have visibility into the data centre infrastructure of its hosting service provider. Part of the problem was that the hosting service provider was managed entirely by Emori’s IT partner. “So, we didn’t know what was happening,” she says. As Emori’s ERP system was considered mission-critical, the company, with offices throughout Asia, decided to pull the plug on its IT partner and its hosting service provider. Faced with these setbacks, it would not be surprising if Emori chose to regain control and move its server back to its own premises. But it did not. Instead, it switched to a dedicated server hosted by ReadySpace, a leading cloud service provider in the Asia Pacific region. As part of ReadySpace’s suite of private cloud offerings, the dedicated server comes with managed security and server management services, which are highly beneficial to organisations like Emori. Today, Emori’s ReadySpace dedicated server runs three virtual machines and serves eight offices across the Asia-Pacific region, including Japan, United States, Philippines, Thailand, Indonesia, Singapore, Hong Kong and Vietnam. The server also powers seven databases that contain not just customer information, but also mission-critical data such as accounting records. The Emori spokesperson says the migration work was completed in just three weeks, after the company shared its technology requirements with ReadySpace. Emori also chanced upon an unintended benefit after the switch to ReadySpace. Previously, its employees had problems sending and receiving e-mails while being connected to the previous service provider’s data centre via a virtual private network (VPN) connection. “We don’t know why, but when we switched to ReadySpace, those problems were somehow resolved,” the Emori spokesperson says. So far, Emori has not experienced any downtime with its dedicated server, which is hosted in ReadySpace’s Singapore data centre at Equinix, a global data centre provider. That has given Emori greater assurance, and more importantly, a vote of confidence following the data loss incident. “We visited the Equinix data centre and were assured that security would be well taken care of with strong firewall controls,” she says. “ReadySpace is also looking at setting up another data centre, which means we will be able to back up our server and databases to another location in future,” she adds. Meanwhile, Emori is not taking any chances. It now backs up its databases onto a different server in the same data centre as a disaster recovery measure. Emori is also using ReadySpace to improve productivity and employee collaboration. For one thing, it has set up a file server using ReadySpace’s cloud service for its office in Vietnam, where employees can download and share corporate reports and other information through their mobile devices. “We are trying it out to see how it works out,” she says. “If it’s well-received and successful, we may extend it to other countries in future,” she says. Indeed, Emori will continue to host its servers with ReadySpace as it expands its footprint in more countries. “If we have new applications or set up new offices, we will choose ReadySpace as long as they have a data centre nearby”. 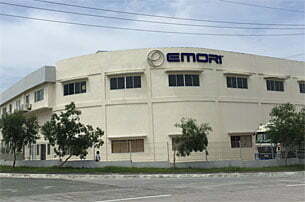 Emori Holdings had lost a day’s worth of corporate data on its ERP system due to a malware attack. Its hands were tied as it had no visiblity into the data centre infrastructure of its previous service provider. Its employees also had problems accessing e-mails while being connected to its hosting service provider via VPN. The company’s management decided that it was time to switch to a more reliable hosting service provider. With a ReadySpace Dedicated Server, hardware, network and software elements are monitored with the best tools. We can even tell whether the hard disk is failing before it fails. With a 1000Mbps port, 1000GB traffic transfer with eight public IPs and a suite of managed services, you can be assured that your business will run securely at full speed without slowing down. ReadySpace focuses on providing Cloud Services to businesses with applications that require Performance, Compliance and Connectivity in Asia. Our services are offered at competitive prices, with above-industry level service, consultation and support for businesses of all sizes. Through a single dashboard, our customers can choose the services they need to be successful in their business.